The Basic Rooms Are Totally Fine. It’s expensive, yes. But don’t fool yourself into thinking Disney is ever cheap. To save, forgo a suite and book one of the plenty-spacious (500 sq ft) Four Seasons Rooms (floors 2-4), which start at $399 in low season, $795 in high season (holidays and spring break). These standard rooms include one king or two double beds as well as a queen-sized sofa bed. You’ll also get a marble bathroom (with a deep soaking tub, double-sink vanity, and an in-mirror television), plus a private terrace. For an extra $400(ish) a night, book a Park View Room so the kids can watch the Magic Kingdom fireworks in their jammies. They Have Everything You Need. Seriously. Welcome amenities include organic baby food, a Four Seasons Orlando bib, chocolate alligator lollypops, child-sized bathrobes and slippers, and baby and children’s toiletries from La Bottega. You can also call ahead to have your fridge pre-stocked with whatever you need (at no extra charge beyond the items purchased) and to request a complimentary crib, which comes with sheets (if you dare) plus enough Huggies diapers and American Hotel Register Company wipes to get you started. High chairs and diaper pails are available upon request, at no charge. Four Seasons-owned Maclaren strollers can be rented for $15/day, and families can also request play-yards, toys, childproofing items, children’s videos, pool toys, and Little Swimmers diapers. Just be sure to reserve whatever you need well in advance as the hotel does run out of family amenities on occasion. It’s okay. Really, it is. Luxury coaches run every 30 minutes from the hotel to Magic Kingdom/Epcot (and back), and regularly (roughly every hour) to all four parks. If you have your own car, car seats can be arranged for an additional fee. 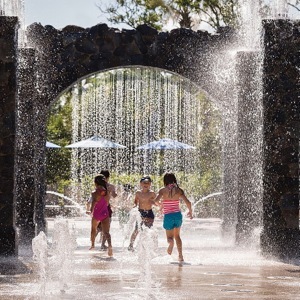 While the Four Seasons concierge and Disney Planning Center (located in the hotel lobby) can help arrange VIP tours of the Disney parks, court-side seats at Magic games, luxury exotic car rentals, helicopter tours, eco-tours on airboats and much more, we recommend booking a private guide through Stone VIPs. Managed by ex-Disney staffer Eugen Schnee, the guides cost a fraction of what official Disney guides charge but can fast-pass you through any ride you wish (and always know where to find the nearest restroom). 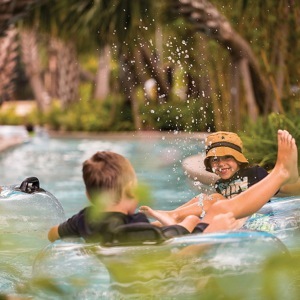 When the throngs and character chaos begin to overwhelm (and we promise they will), spend a lazy afternoon at the Four Seasons’ exquisite wade-in Explorer Pool, in the Splash Zone, or floating along the Lazy River. A morning bomboli, afternoon espresso, or anytime gelato at the sleek Lickity-Split will make you feel human, too. If a date night is in the cards, book a thoroughly vetted sitter through the concierge and settle in for incomparable firework views from the terrace at chef Tim Dacey’s Capa, the 17th-floor rooftop contemporary spanish steakhouse. Novelist and blogger Aidan Donnelley Rowley is the author of Life After Yes and The Ramblers, now available for pre-order at barnesandnoble.com. Aidan hosts a wildly popular series of author events at her Happier Hour Literary Salons in New York City, where she lives with her husband and three daughters.